Do What You Do, Even Better with GLOMACS Training! GLOMACS Trainings are designed to Unlock the Potential of Real People in Real Situations. GLOMACS core competency is the provision of Continuing Professional Development & Training to achieve measurable improvements in People, Performance & Profits. The Impact of Training is Transformational. People need Emotional Investment and they also need to feel time is being invested in them & GLOMACS Training is a great way of doing that. Education and Training shouldn't end when the person is hired. Nothing stays static, and in today's ever-changing business environment that is more the case than ever. Effective training, by experienced professional trainers from GLOMACS can have a wide-ranging impact on the individual being trained, the company he or she works for, and the industry as a whole. GLOMACS has a passion for excellence and operates under the highest of business and ethical standards. We are proud to have earned recognition as an ISO 9001:2008 and ISO 29990:2010 Certified Training and Consultancy Company. GLOMACS leading-edge training courses provide business professionals the skills they need to develop their competency, improve their performance, and drive business success. Our talented team of international instructors has exceptional credentials complemented by practical, real-world experience. 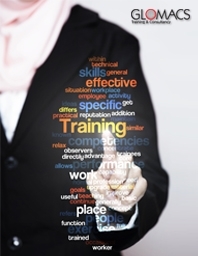 Our clients’ changing needs drive the planning and development of each and every training courses and seminars. We’re continuously tracking the latest business trends and best practices to ensure our content is relevant, practical and useful. GLOMACS successfully delivers training courses throughout the world. GLOMACS’ vision is to promote and enhance competency through practical programmes and events that reflect the latest thinking. GLOMACS Training Solutions Connect Learning to the Workplace, allowing employers to manage and assure the competence of workers at every level. GLOMACS’ vision is to promote and enhance competency through practical seminars and events that reflect the latest thinking. Whereas, our mission is to contribute to the region’s advancement and transformation to a knowledge-based society through the provision of training seminars of the highest caliber, which directly address the current needs and demands of both individuals and industry. We take pride in our ability to respond quickly to market needs and provide you with quality learning courses that are dynamic, leading edge and up to date.